Always fun to have dress-up day at work but by the time I got a photo taken, I had lost my hat! It’s my students’ first Melbourne Cup so I let them keep it for the afternoon to wear while they watched the race. 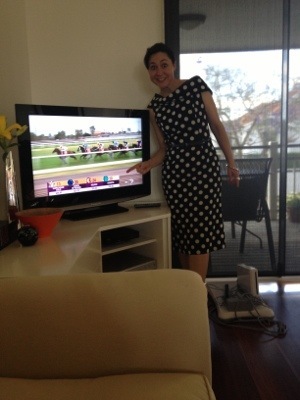 I made it to my mum’s for the afternoon to catch the race on my way to Radio Lollipop Melbourne Cup ii. Posted in Brisbane Fun, fashion, hand-me-down and tagged Melbourne Cup, spring. Bookmark the permalink.